historical ruins, pilgrimage sites, and dramatic landscapes. Straddling Europe and Asia, Turkey is at once modern, intoxicating, sacred, and ancient. Everywhere in Turkey is a feast for the senses. Chaotic bazaars contrast sharply with lovely silence in the mosques of Istanbul. Hiking through the lunar landscapes of Cappadocia is a reminder of the many facets of beauty that exist. The Lycian Coast along the Turquoise Riviera is spectacular, with mythical ruins, secret coves, and secluded mountains. If you love the poetry of Rumi, it is in Turkey that you can feel his influence most. Here are a few highlights of Turkey. Spend a few days exploring the hustle and bustle of Istanbul and the enchanting fairy chimneys of Cappadocia before going in deeper to these other parts of Turkey, where legends, myths, and the mystical live on. Turkey’s “Cotton Castle” is one of a kind wonder of nature. There’s nothing like it anywhere else. Almost 9,000 feet long and 2,000 feet wide, Pamukkale’s hot springs were used as a spa for centuries before the Turkish government made them off-limit to bathers in more recent years, to protect the travertine terraces from further deterioration. Imagine walking barefoot through a snowscape of white cliffs and standing knee-deep in one of the shallow pools filled with warm, chalky blue water. Touch the cool surface of the limestone walls and feel the healing power of the spring water trickling down the wall. 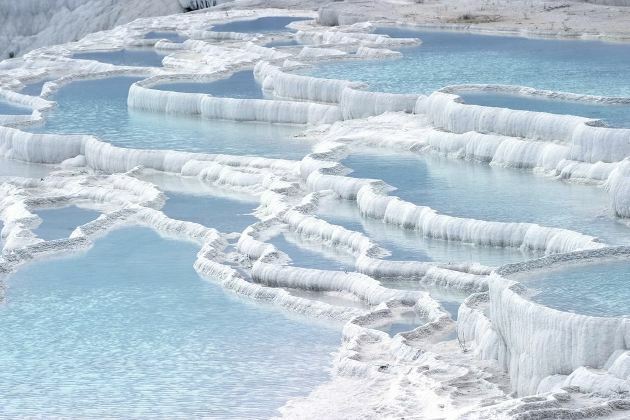 Pamukkale heals and opens the heart with its out of this world beauty. Efes – the Turkish name of Ephesus – is truly a city of the Gods and Goddesses. 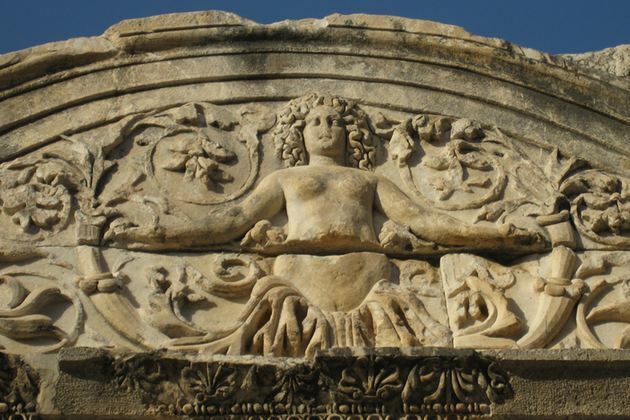 Dedicated to the cult of Artemis, goddess of the hunt (also known as Cybele, goddess of fertility, and Diana), Efes’ well-preserved Roman ruins still exude the grandeur that made it one of the most opulent ancient cities in the Mediterranean. Alexander the Great, St. Paul, St. John and Cleopatra are among the many historic figures who walked along the main street of Curetes during the glory days of Ephesus. Walking around Efes, I was filled with awe as I passed statues and temples dedicated to ancient gods and goddesses. Nearby Ephesus are two popular but vastly different pilgrimage sites: the lonely remains of one of the Seven Wonders of the Ancient World - the Temple of Artemis, and the humble House of the Virgin Mary, where as legend has it, the mother of Jesus spent her later years after fleeing to Ephesus with St. John around AD 37. The conservative town of Konya is the site of the Mevlâna Museum, the burial place of 13th century mystic and poet Mevlâna Celâleddin Rumi, founder of Turkey’s Whirling Dervishes. Faithful pilgrims come to the museum to pay their homage. Some cry at the side of Rumi’s sarcophagus, entirely covered with his poetry and housed under a beautiful green dome decorated with geometric stars. A devout Sufi, Rumi’s messages of love - the universal language of the human soul, appeal to the many of us whose hearts are ready to be open. You can feel the strong mystical energy here, from the sarcophagus to other sacred treasures that include prayer carpets, musical instruments, and hairs from the beard of the prophet Mohammed. A quiet yoga retreat on the stunning Lycian Coast is the perfect way to end a trip to Turkey and take in all its wonders and magic before heading back home. Yuva, a secluded Eco Holiday Center with simple, rustic accommodation, is located mountainside in the village of Faralya amid a forest of olive, citrus, carob, and pinewood trees. The sea is eight minutes away by foot. If you prefer hotel-style accommodation with a pool, Yuva’s sister property Faralya Hotel is two miles away from Yuva and a thirty minute walk from the sea. Join a week of group activities, or create your own independent retreat at either property. There’s plenty of time to rest, swim, practice yoga, and meditate by the sea in this well- kept secret of the coast. Or, you can explore charming towns nearby. The beautiful beach and warm lagoon of Ölüdeniz is only 25 minutes away by bus. Fethiye, nine miles away, has ancient ruins inland and Lycia’s best harbor, where you can hop on a sailboat to tour nearby islands, or swim in the mesmerizing turquoise water of the Aegean and Mediterranean Seas.